Wednesday was a fun day. I turned up at the station at the usual time, only discover that all trains were cancelled due to a defective train further up the line. Since I can work from home, and the station was giving no information about when the problem would be resolved, I went home. Coincidentally, Alexandre was feeling a bit ill on Wednesday and we had already decided he could miss karate this week. As I was already home, it made sense for him to stay at home with me rather than go to the sports centre to watch his brothers for an hour. This, of course, meant that it was Alexandre and I that went to collect the pizzas. The TV in the pizza takeaway happened to be tuned to a music channel this week. One of the songs that happened to come up was The Nights by Avicii. This is now Alexandre’s favourite song. I think he was mainly inspired by the footage of people jumping off things. Whatever the appeal, though, I can’t fault his taste. I am supposed to be working from home today. Pepper does not approve of this plan. So I powered on the PC last night intending to finish off a few bits and pieces that I really should have done over the weekend. Chili, however, had other ideas. And with that, Project Candy was launched. It has taken a while as we had to acquire plenty of cardboard boxes as well as a glue gun that an eight-year old can manage as well as assorted other building materials. But, this weekend, we completed the the candy machine, loaded it up, and it worked. Or it did until the cat kicked it off a shelf today. Given that he’s eight, I am both surprised and impressed at how well he has stuck with this. The process has been a bit piecemeal — we do a bit, leave it for a week, and then come back and do a bit more. But the project was never abandoned and, especially when we started seeing things coming together he became increasingly keen to complete the machine. I have been surprised to learn that there is quite a variety of cardboard constructions being built on YouTube and, now that William is happy handling both a Stanley knife and a glue gun, he wants to build a safe. It’s been a cold weekend, but the sun was out and the ground was dry so, on Sunday, we went out for a walk in the woods. It turned out to have been a bit colder than I realised. So cold, in fact, that even the statues were wearing scarves. Wednesday night is karate night. Not for me, but all three of the boys spend an hour improving their martial arts. It’s an interesting sport and one from which (I hope) all three are benefiting. This is certainly the case for the eldest who has already competed in several tournaments and who is in training for his next. Since I am home before the karate lesson finishes, organising dinner often falls to me, which is handy because Wednesday night is also cheap pizza night — any pizza for €6.50. They’re good pizzas, too. Over the years, several pizzerias have come and gone locally, but this one has always remained. It’s been through a couple of changes of ownership while we’ve been in Belgium, but the restaurant itself has remained pretty much unchanged — cheap, friendly and reliable. Clearly, a winning formula is not to be messed with. So here I sit, enjoying a glass of Duvel and finding myself being pleasantly surprised by the WordPress app. I installed this app some time ago, back when this blog was still self-hosted, and… it wasn’t very good. The app had a rather annoying habit of freezing — generally when I wanted to upload a draft — which led to me removing the app out of frustration. Now that I have WordPress hosting the blog for, I thought I’d give the app another go. It’s not always as intuitive as I would like but it does seem to be a lot more reliable now and I have been able to successfully use it to follow conversations where possible. The acid test, of course, will be to see what happens when I press the Publish button. Earlier this month, Alexandre sat me down to gently explain that Santa Clause isn’t real. Well, someone has climbed down our frighteningly narrow chimney, availed themself of a large glass of whisky and delivered a sizable stack of presents. And I know exactly how he will explain that. So all that remains is for me to shut down, turn in and ensure that I am suitably rested for the festivities of… later today. Here’s wishing you all the best for the season and hoping that your Christmas is every bit as enjoyable as I intend mine to be. A couple of months ago, Alex acquired a water filter. A small one, obviously, but a working one designed to demonstrate how water filtration works. The system has three layers — containing stones, sand and filter paper respectively — and when you pour the dirty water into the top, cleanish water drips out of the bottom. A couple of weekends ago, we finally found the time to set it up. So set it up we did and I gave the twins a beaker of water and told them to dissolve a little bit of soil in it. Of course, there is only one way to test the results. And before anyone asks, I did cheat a little bit for the final photo. The filter certainly did a good job of clearing the water, but was nowhere near effective enough to clean the findings of a pair of determined eight-year-olds. I removed that last bit of cloudiness by replacing the filtered water with tap water. We appear to have another pair of twins in the house. Not human ones this time, which is why we can get away with giving them names like Chili and Pepper. They seem to have settled in pretty quickly, though. I have mentioned Macsen’s karate once before on this blog. 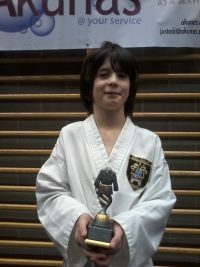 Today was his second tournament – the Belgian JKF Gojukai championship. Macsen made it through four fights, winning three of them – spectacularly in the case of the first fight. Although he didn’t manage to win the final fight, it was very close with only one point in it. And his performance was good enough to win second place. Suffice to say, proud dad is very proud indeed.